Because people with communication difficulties need to be heard, understood, valued and empowered! Openstorytellers helps individuals, groups, support staff and families to work together to improve communication, which leads to improved confidence, a sense of empowerment and reduced risk of social isolation. 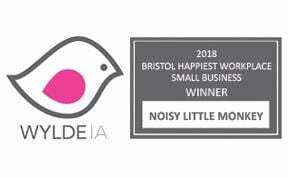 What benefits would Noisy Little Money’s offer bring to our organisation? 1. We have already proven that a small investment in social media has reaped huge benefits. Through Facebook and Twitter we have linked with national and international groups working in our sector, highlighting current issues and opportunities for collaboration with other organisations in storytelling, learning disability, social care, and the arts. This can only be improved with expert advice, training and targeted marketing campaigns. 2. Most communication aids are cumbersome and very different from the gadgets used in the mainstream, and they don’t invite non-disabled people to interact with the person with a disability. iPads are an attractive tool that are socially desirable and would be familiar to non-disabled people. As part of a three year research project in a Special School in Bath Openstorytellers are trialing the use of iPads with students and teachers as an effective communication aid. People with profound and complex needs, who maybe non-verbal, need support to communicate, to be empowered, to have control over their life, develop friendships and interact with the community. We need expert help to disseminate the results of the research project as effectively as possible. 3. Openstorytellers runs book clubs for people who don’t read. Whatever your ability or disability we want everyone to be able to engage with classic works of literature and traditional stories. We take a Greek myth, a traditional tale or a Shakespearean masterpiece and make it accessible for all. We use all the senses to bring the story to life and create abridged versions of the story using pictures and symbols to tell the story. Over the past 10 years we have devised and run many projects to help people with a learning disability take part in community activities, be exposed to classic and traditional stories, and to develop communication techniques. As you can imagine have built a library of valuable resources which we would like to share with a wider audience, to reach more people who could benefit while generating an income for the organisation (making us less dependent on grants). Through an on-line shop our resources can be downloadable without a hefty investment of publishing our books and resources. We would like to use these resources to develop on-line training tools for staff and accessible books for non-readers – benefiting more people without a large financial outlay; which in turn would make us less reliant on grants. 4. With only three part-time office staff we have been improving our website in-house, which has brought us exposure and opportunities. The website is the first port of call for prospective funders. We have uploaded films to show our work in action and have an online donation button. We know there is more we can do, and we would appreciate the expert advice and investment offered by Noisy Little Monkey, to reach our potential. 5. We would like to make our web-site accessible to all communication needs - we have the experts ready to advise and test any improvements we can make! Why should we be the chosen charity? 1. Because we are a communication charity. 3. Because we want to earn income through online sales and to become less reliant on grants. We're counting the number of Tweets, Likes, Pins and +1s this page gets, using the sharing buttons at the top and bottom of the page. The volume of these shares will help the judges choose who should receive our help, so get sharing! Then, really help the cause by using the Facebook comments below to tell us why YOU think Openstorytellers should win £9,000 of digital marketing. GO!